Our Products >> Where's the Ivy? Now Available! First in the New Forums Regional Fiction series. Marc Cullison brings the world of academia to life as he reveals the rewards, struggles, and politics that reside through the halls of Hartmann College. August Lane has left behind a secure and steadfast career to try his hand in higher education, hoping that by imparting his knowledge as a professor he can gain the life answers he desperately seeks. But what he finds is that not everyone’s motive for being at Hartmann is to bask in the sanctity of education. Lane finds himself encountering problems outside of his own doubts and insecurities, and with those of devious students and conniving colleagues. On his semester-long journey he gains the friendship of a few kindred spirits, and plunges forward as he battles his way through lesson plans, neglectful faculty, and a corrupt tradition of mediocre education. Marc Cullison’s characters are complex and satisfying as they pull the reader into the story and onto the Hartmann College campus. The sincere account of a visionary professor will have every reader wanting to be August Lane by the end of the book. 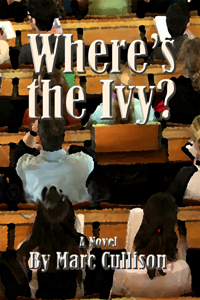 Long Time Oklahoman Marc Cullison launches his first novel Where’s the Ivy? as the premiere in New Forums Press Regional Fiction Series. Graduated from Oklahoma State University with a degree in Architectural Engineering, he once worked as a professional engineer and currently teaches at Connors State College in the Math/Science Department at Warner,Oklahoma. He lives near Sallisaw, Oklahoma, with his wife.